Skirt steak has become our favorite red meat to grill. It is extremely tender and flavorful. We have several recipes for marinades that we really like, but we are always looking for a new way to prepare our favorite foods. This marinade is adapted from the recipe I learned at The Ritz Carlton Cooking School. I really enjoyed this recipe then, and I was excited to give it a try at home. The marinade is packed full of flavor! It has tons of fresh garlic, parsley, cilantro and lemon juice. It smelled fantastic on the grill. We marinated the skirt steak in the olive oil and herb mixture, but you could also just brush it on after you cook the steak. The skirt steak was delicious! It tasted even better than I remembered. We both agreed that this recipe was a keeper! In a food processor, pulse the garlic until minced. Add the parsley, cilantro, salt, and pepper. With the motor running, add lemon juice and olive oil in a steady stream. 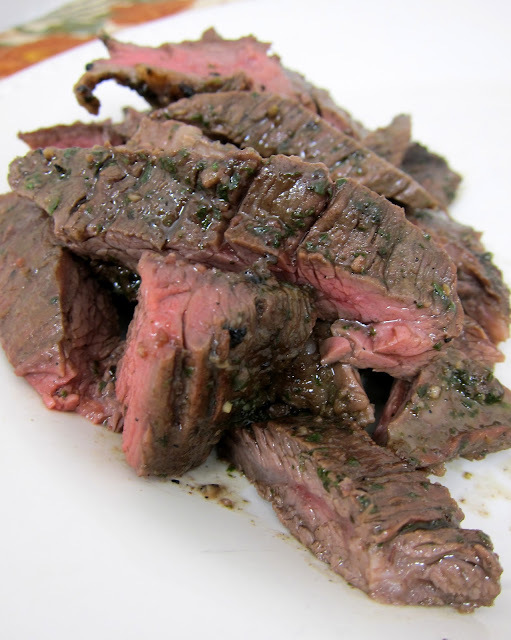 Pour over skirt steak and marinate in the refrigerator for at least one hour. Remove steak from marinate 10 minutes prior to grilling. Grill for 3-5 minutes per side or to desired degree of doneness. Allow steak to rest 5 minutes before slicing against the grain. I must have missed the Ritz Carlton post - what a great opportunity. The marinade sounds delicious and your steak looks mouth watering. I can't seem to find skirt steak around here and assume it's all going to the restaurants for fajitas. This post is making me so hungry! Now I am craving steak. Thanks for the recipe, I always like when food has a herbal flare! Oh, I just had to comment... now all you need is some pico de gallo, guacamole and soft flour tortillas and you have the best fajitas ever!!! 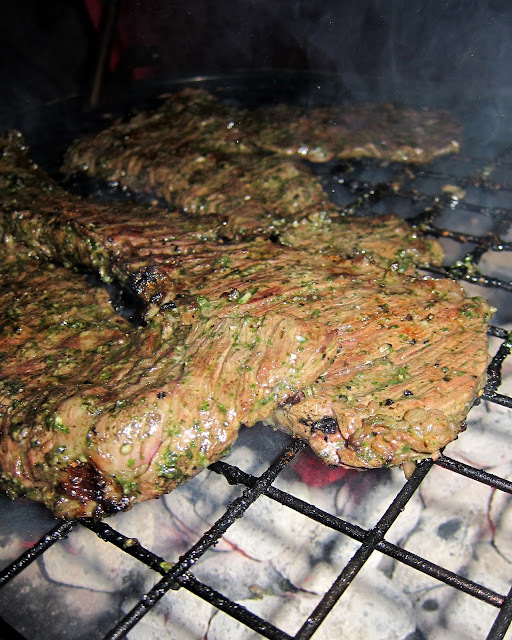 Skirt steak (aka fajita meat) is a main staple down here in texas. I love your blog and your recipes. Thanks for sharing. That looks so good!! Thanks for the recipe and eye candy. Seems like a good chimichurri sauce, one of my favorite beef marinades/condiments, minus the red wine vinegar. I like this one a lot Steph. I could do with a slab of beef! This is the best meat marinade I have ever tried. We are going to make it again this weekend using a flat iron instead of a skirt steak.